Plato also contends that art appeals to and/or evokes emotions that are detrimental to man’s acquisition of knowledge and truth. Art, therefore, was not good for man to pursue, and should be excluded from a culture. Aristotle disagreed … He believed that poetry, music, and the arts serve to communicate universal themes and ideas that are beneficial to man… Aristotle praised man’s creation and appreciation of art and defended it as a significant contribution to culture. .. In the book What Is Art?, Leo Tolstoy says, “To evoke in oneself a feeling one has experienced, and having evoked it in oneself, then by means of movements, lines, colors, sounds or forms expressed in words, so to transmit that feeling that others may experience the same feeling, that is the activity of art.” The “activity of art” then, as expressed in this quote, comes in three phases: inspiration, expression, and distribution. 1. (Standards RI 5, 6, 7; ELA 5, 6; CC 4, 6, 8) Find references in Moving to Higher Ground that relate to the importance of art in a culture. 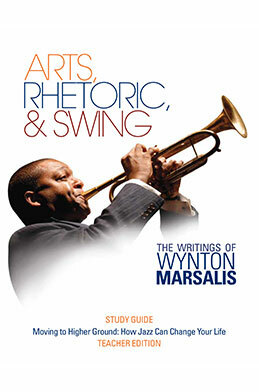 According to Marsalis, what role does or should art have in a culture? 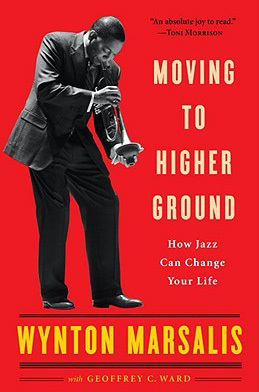 What role does Marsalis think art currently has in American culture? What does he add to Aristotle’s ideas about art? 2. (Standards W 1, 2) Which philosopher do you agree with regarding art (remember, art includes music, literature, painting, sculpting, etc.)? Write a letter to a school board member or congressperson, persuading him or her to keep funding for arts in the schools. Support your opinion using logos, pathos, and ethos. 3. (Standards RI 1, 7) Discuss how Tolstoy’s three phases of art relate to Marsalis’s comments about the blues, jazz, or art in general.